At the moment, with the exception of the weekend, when I get up in the morning, it's still relatively dark and when I get home from work, you guessed it - it's dark again. The bonus of this is it usually means more cosy nights in but it does make it a little bit harder for outfit post moments. Each year I get a buzz of excitement when I leave work and for the first time in a few months, it's still bright outside. I can see the evenings getting a little bit longer each day and I can't wait for the long evenings in come in. It's my favourite time of year. What's your favourite time of year? It's actually gotten quite cold here the last week so I'm not going anywhere without a coat. This is what I was wearing at the weekend. With the 3/4 length sleeves on this coat, I initially wore it mostly when it wasn't too cold outside. That was however until I invested in some long sleeved gloves. They're fingerless gloves and has a part that flips over to cover your fingers. Whoever thought of that was a little genius. You can do so much more without having to take them on and off all the time. I always see bobbles on the top of a hat but I thought this one was a little different with the bobbles at the side. So cute! 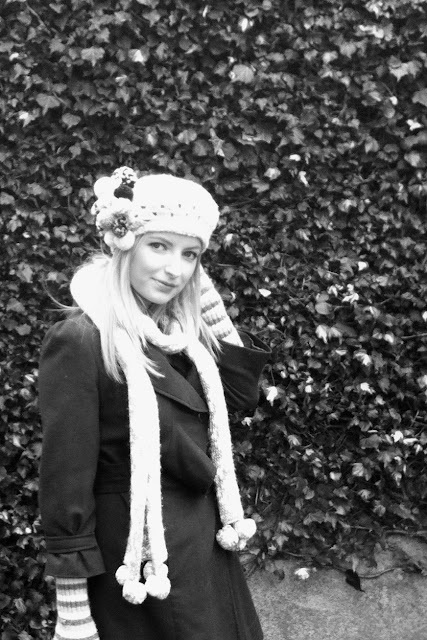 All those poms make this look so festive and fun for winter...Chic and comfy! Such a cute outfit! I adore your coat, the colour is so amazing! Your winter accessories are so cute, especially the hat and scarf, you look fabulous and comfy! Love your hat!! I think it's just what I need for this weather! Just discovered your blog, love your hat! Can't wait to see more! And I love your blue coat! So cute! Your coat is amazing, I love the color. What a cute outfit! Love the color of your coat!